SANDY — It wasn’t the best night for Real Salt Lake, surely not one for record books. Was Wednesday’s 1-1 tie with the New York Red Bulls a success? A disaster? Actually, it was a big scoop of vanilla ice cream. It could have been sweeter. 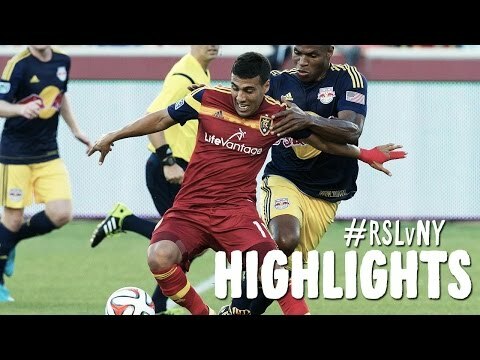 So RSL’s July home stretch ended on a no-decision. On the bright side, a point in the standings counts. But home is where you’re supposed to rack up points, especially against poor-to-middling teams like New York. Give it to coach Jeff Cassar, he’s making bread pudding out of white bread. He noted that Colorado and Vancouver lost and tied, respectively, so RSL didn’t lose ground. Minus top scorer Alvaro Saborio — expected out another six weeks with a fractured foot — Real isn’t yet a threat to return to the MLS Cup Final, where it left unfinished business on a brittle-cold Kansas City afternoon last December. The team did get national team members Nick Rimando and Kyle Beckerman back after World Cup play this month, which made the lineup mostly whole. Meanwhile, things have been somewhat improving, thanks to a July filled with home matches. After going winless in seven of eight, dating back to late May, RSL got rolling on July 24 by rubbing out Montreal, 3-1. In the last two months, though, the only MLS wins have come on July 4 (New England) and July 24 (Montreal). If there’s a fireworks show afterward, RSL is unstoppable. Rimando’s last shutout was April 19 vs. Portland. If there was a good time to tie the shutout record, Wednesday would have been it. New York is a team Rimando had blanked four consecutive times. New York has never won in Utah. Until Wednesday, the Red Bulls hadn’t scored in Salt Lake in the regular season since 2008 — just a year after Jason Kreis retired. Despite winning just two of nine matches since mid-May, RSL has weathered the absence of its stars and remains in second place in the Western Conference. The Pride of Sandy is hanging around. In part, that’s due to the competition. This month Real has faced three fifth-place teams, one sixth and one 10th. In that span it went 2-1-2, the loss being a difficult road game at Los Angeles. From here it gets tougher. In August, just two of five matches are at RTS. September and October are even splits. On Wednesday, Rimando got all he might have needed in the 18th minute on diminutive Joao Plata’s tally from left of the goal. Rimando’s shutout hopes nearly died in a 37th-minute flurry after he bobbled the ball and Ambroise Oyongo suddenly had an open net, 10 feet out. Instead, Oyongo kicked the ball up the I-15 ramp. RSL headed to the locker room at half with an edge in possession time, shots on goal and people under 5 foot 4 who can really score. But Rimando lost another chance to put his name in the record books when Henry Thierry scored in the 57th minute. Disappointing to Rimando, aggravating for the team, but mildly encouraging to the coach. In the 78th, New York’s Jamison Olave and Salt Lake’s Olmes Garcia had words and Olave — via Twitter snapshots — appeared to grab Garcia in the nether region. Garcia went down, looking mortally injured, but a yellow card said otherwise. That did little to improve the mood at RTS. But the chance for “very many” wins was gone with the wind.